These are the BEST meatball subs! 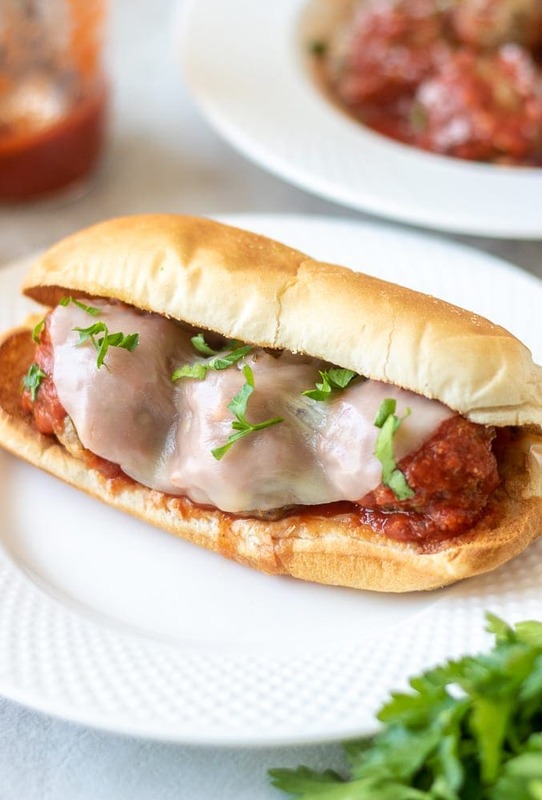 Made with a garlic toasted bun, tender meatballs, homemade tomato sauce and provolone cheese, these meatball sub sandwiches are guaranteed to satisfy. One of my favorite meals as a child was meatball sub sandwiches. Meatballs piled on a toasted bun with melted cheese was just comfort food to me. In my opinion, there are decent meatball subs and there are knock-it out of the park meatball subs. 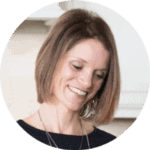 And I am sharing with you how to make a knock-it out of the park sub sandwich. My recipe for meatball subs starts with homemade meatballs that are filled with INCREDIBLE flavor and homemade tomato sauce. Served on a toasted bun that has been flavored with garlic and smothered in provolone cheese. It is ooey, gooey, savory perfection. The difference between a good meatball sub and a great meatball sub are all in the details. With minimal ingredients needed to make a meatball sub sandwich, it is essential to choose your ingredients wisely. 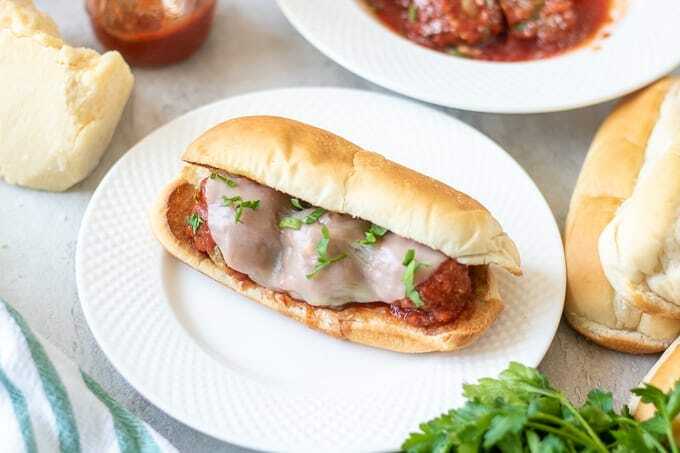 Yes, you can use any frozen or store-bought meatballs you like for meatball subs, but for the BEST meatball sub, I strongly suggest homemade meatballs. Instant Pot Meatballs work well in this recipe as well. Again, you can use any store bought marinara/spaghetti sauce you like. While I prefer my homemade marinara sauce, there are really good quality brands on the market. You want a thick bun that has room for 3-4 meatballs per sub. Provolone is my go to cheese for meatball subs. 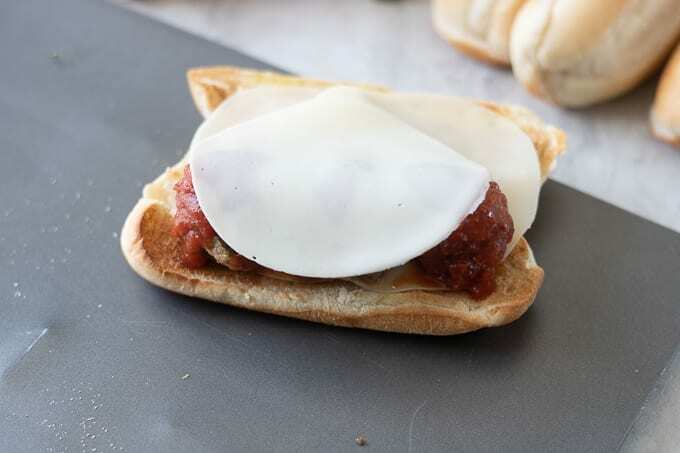 Thinly sliced provolone is best so that the cheese melts sufficiently to fully cover the bun and meatballs. 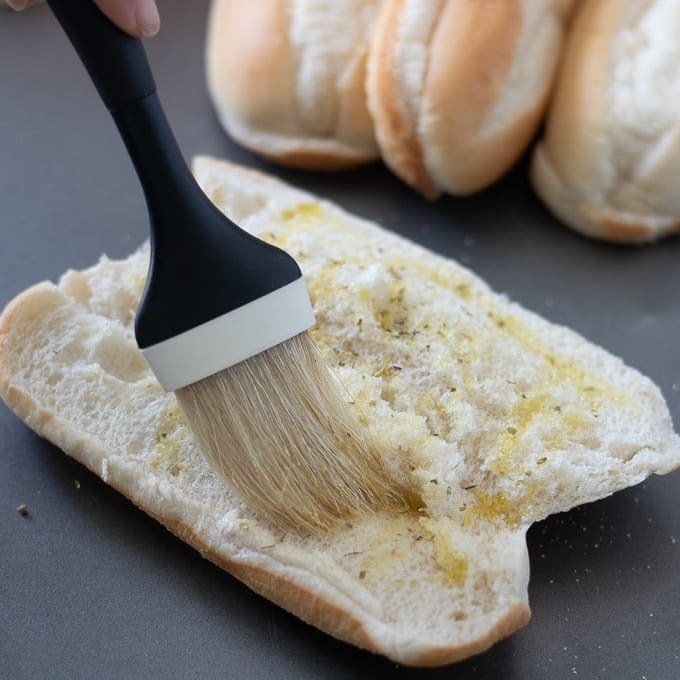 Used to help perfectly toast the hoagie bun. Mix garlic powder and dried oregano into the olive oil for an added layer of flavor to these meatball sandwiches. Make Oven Baked Meatballs or Instant Pot Meatballs. Mix prepared meatballs with just enough sauce to coat. For one batch of meatballs this is typically 2 cups sauce. If using frozen meatballs, warm through in sauce before assembling meatball subs. Toasting the buns ensures that you will not have a soggy meatball sub. Mix together olive oil and seasonings. Place seasoned opened buns on cookie sheet and bake for 5 minutes, or until golden. 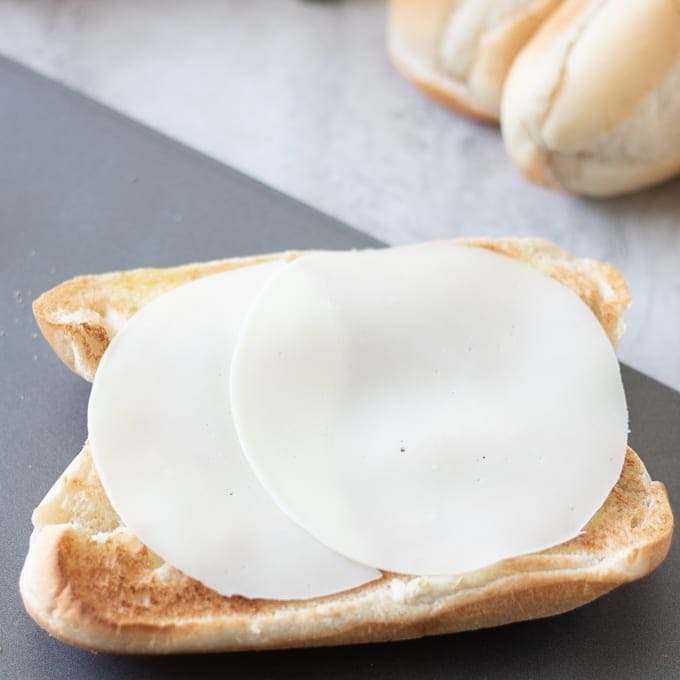 Place provolone cheese slices on bun, overlapping to cover surface of the bun. This step helps to keep the sandwich from getting soggy as well. Top toasted bun with 3-4 meatballs. Top with another piece of provolone cheese. Return to oven to bake for 5 minutes or until cheese is melted. Remove from oven and close bun and serve. 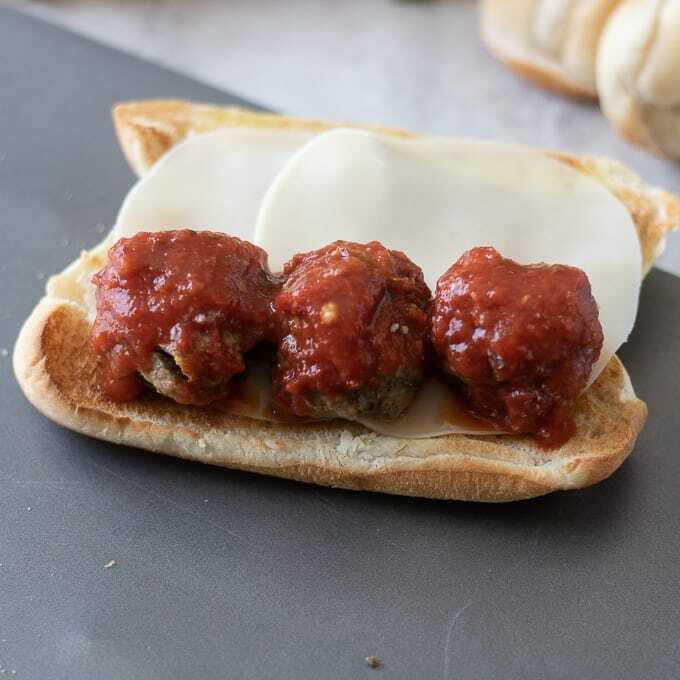 Made with a garlic toasted bun, tender meatballs, homemade tomato sauce and provolone cheese, these meatball sub sandwiches are guaranteed to satisfy. 8 ounces provolone cheese thinly sliced. Gently mix together prepared meatballs with marinara sauce. Set aside. Place opened buns on large cookie sheet. Mix together olive oil with garlic and oregano and brush on the opened sides of the buns. Toast buns for 5 minutes, or until just browned. Remove buns from oven and place 2 slices of provolone cheese on each bun, slightly overlapping to cover surface of the bun. Top with 3 large (or 4 smaller) meatballs and an additional slice of cheese. Return to oven and bake for 5-7 minutes or until cheese is melted. Close sandwich and serve meatball subs. 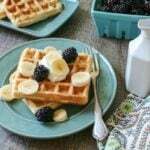 My kids would love this for dinner. I love all of the step by step directions, it makes it so much easier. So glad the tips help! Enjoy! 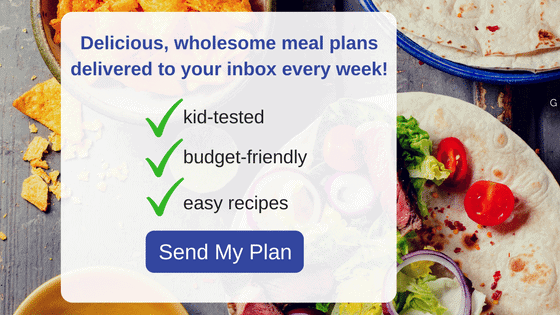 I love all the tips, and these subs look so scrumptious! And thank you for the meatball recipe too. My husband would love this! YAY!!! This is a winner in my husband’s book as well!